I really wanted to participate in Short Story Sunday at least once before the end of the RIP Challenge. And I know I should have posted this yesterday, but an unplanned viewing of Indiana Jones and The Temple of Doom (for the 150th time, probably) got in the way. I swear, that movie never gets old. "Ashputtle" by Angela Carter is a retelling of the fairy tale "Cinderella" in which Cinderella is helped by the ghost of her deceased mother. If I am not mistaken, there are actually some traditional versions of the tale in which this happens. Angela Carter's retelling is, at only three pages, very short, but it's beautifully written, and it's an example of what a fantastic storyteller she was. In "The July Ghost" by A.S. Byatt, a man is at a party telling a woman he just met why it is that he has to move away from his current living place as soon as possible. As you might have guessed, given the theme of this book, the reason involves ghosts. This is an exquisitely written, subtle, emotional and perfectly paced story that reminded me of why it is that I like A.S. Byatt so much. "Who's Been Sitting in my Car?" by Antonia Fraser was the most chilling of all four stories. It's the story of a divorced woman with two children that starts finding cigarettes in her car's ashtray in the morning. Furthermore, the gas tank gets mysteriously empty, so she assumes that someone has been stealing her car and driving it around at night. But the being responsible for this turns out not to be a thief, not exactly. This story has an extremely unsettling ending, which I won't give away, of course. But I do encourage you all to read it if you have the chance. "The Violet Car" by E. Nesbit is the first person story of a nurse who once worked for a very peculiar old couple: both of them believed that the nurse had been hired because the other had gone mad. Of course, it turned out that both were wrong, and that something else was responsible for the strange things that were happening... I thought that this was a very well-told story, and once again I was reminded that I need to read more of E. Nesbit's work. And that was it for this week. Next Sunday is the last Sunday before Halloween, and I'm hoping to be able to do this again - maybe with more stories from this book, or maybe with some of Sir Arthur Conan Doyle's supernatural tales. In the folktale book Annie and I have been reading from, there is a traditional version called "Ashenputtle"...hope I can find this one by Angela Carter...would be fun to read both. And I'd really like to read "Who's Been Sitting in my Car? "...you've left me so intrigued! Sounds like that book was a nice find! And by the way, I've been wanting to thank you for coming by to cheer me on...it made it so much more fun seeing "familiar faces" like you and Chris! I had to read Angela Carter's Ashputtle for a mythology class I took a few years ago, as well as some of her other short stories - I quite enjoyed her work. I think I'll make a note of this anthology for next year. All the stories sound worthy to be read. Did you know they are making another Indy movie right now? Can you believe it? Harrison, err I mean Indy.. is always worth watching!! This sounds like another book I'd really enjoy--what a wonderful group of authors! I'm loving Byatt's Djinn in the Nightingale's Eye, and I've enjoyed a number of Fraser's histories, and am a long-time fan of Nesbitt. I'll have to search for a copy of this book. You are right....Temple of Doom never gets old!! Love that show! I'm glad I'm not the only one that has trouble reviewing Short Stories!! Each time I've done this with Fragile Things, it's been hard to describe the stories without giving something away! But you did great! I'll have to check out this book! I hope you'll submit this post to the Bookworms carnival, since the theme is short stories next month. What a great find! I haven't heard of this but I'm definitely adding to my TBR list. I love good ghost stories. Debi: I think I have read that version somewhere, but I can't remember where. It would be fun to read both for sure! You're welcome :) It was a lot of fun to read about how you and Eva and Dewey and everyone else were doing! Next year I'm in for sure. Court: It is a good reason, isn't it? I do love her short stories. "The Bloody Chamber" is one of my favourite short story collections. Petunia: All the authors in the anthology are female, and they include Charlotte Bronte and Edith Wharton, for example. It goes from Victorian times to the late 20th century, and if all the stories are as good as these four, it will be a GREAT anthology. did read about that new Indiana Jones movie! I really hope it's good! Eva: It was a fantastic find! I love charity shops. Robin: The Djinn in the Nightingale's Eye is one of my favourite books! I can't wait to read your full review. Stephanie: It is hard, but you've been doing a great job with the stories in Fragile Things, worry not! Dewey: Thanks for the reminder - I think I will! 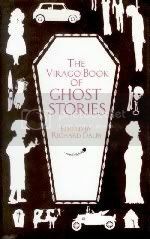 Iliana: I love good ghost stories as well, and this book seems to be full of them!